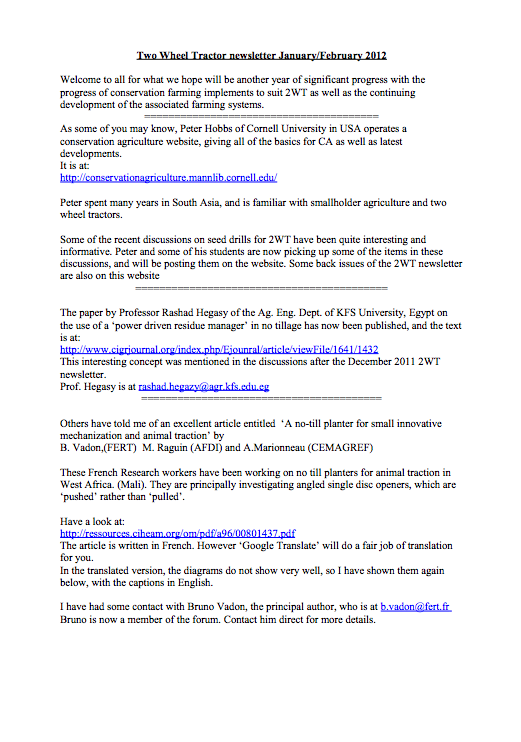 Click on the date or image to access the full PDF. As always, if you have any questions or need assistance, don't hesitate to contact us! Tracked 2WT - a viable option? ARC Gongli 2WT for rice? Cambodian 12 row drum seeder, powered by a 12HP two wheel tractor for direct seeding in puddled rice fields. 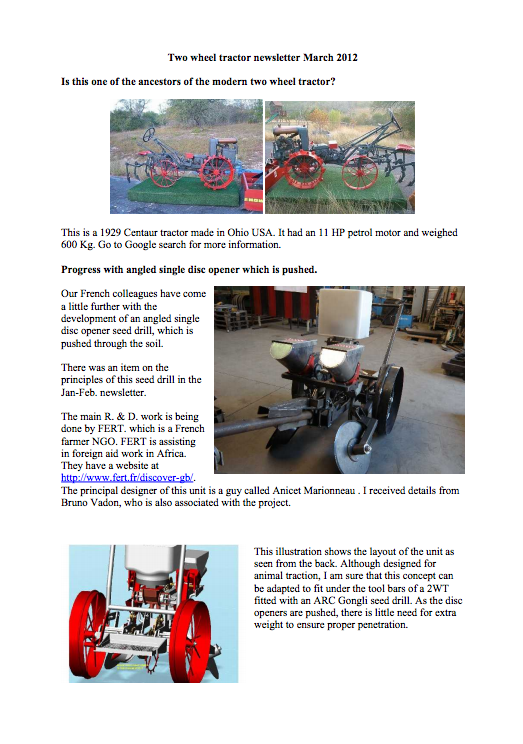 A look at the Khedut Agro 2WT seed drill from India and a French-made single disc opener. 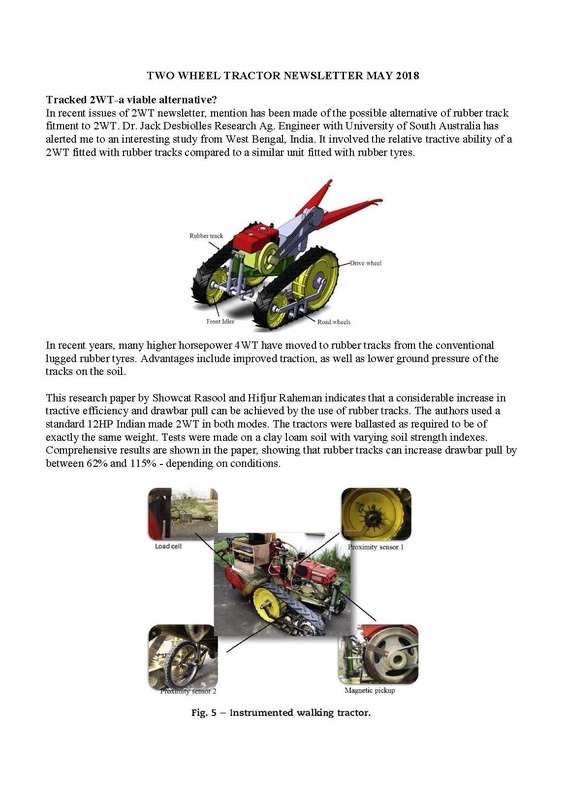 University of Southern Queensland student undertakes two-wheel tractor project this year. Two-wheel tractor seed drill, adding a power take-off (PTO) to a two-wheel tractor. 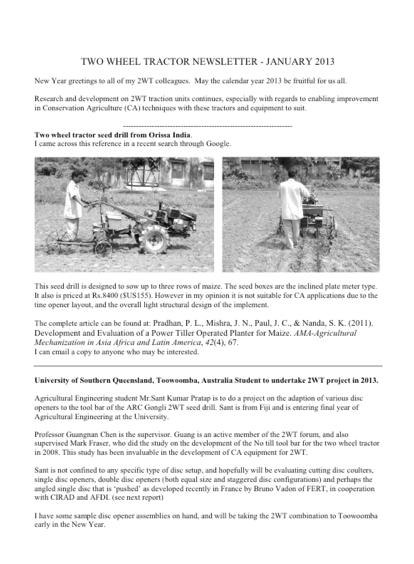 Pictures of a Thai-built two wheel tractor seed drill and information on the Conference for Conservation Agriculture for Smallholders in Asia and Africa (December 2013). 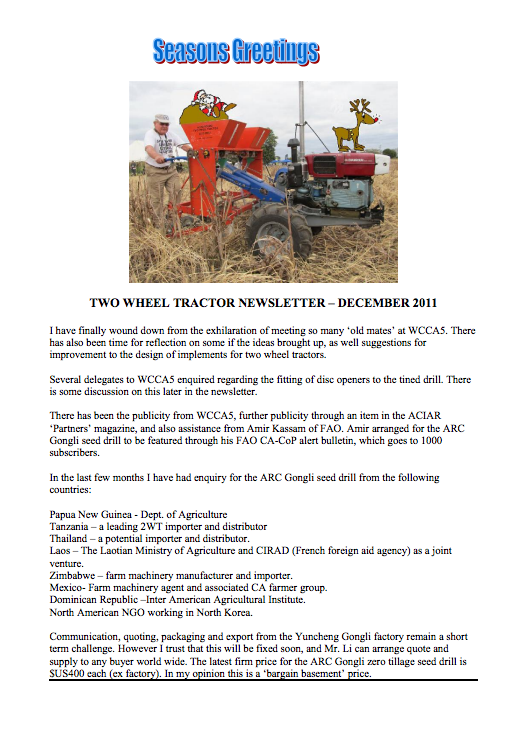 Farm Power and Conservation Agriculture: The potential for two-wheel tractors in Sub-Saharan Africa. Dual range fluted roller seed meter vs. inclined plate seed meter - which is better value? 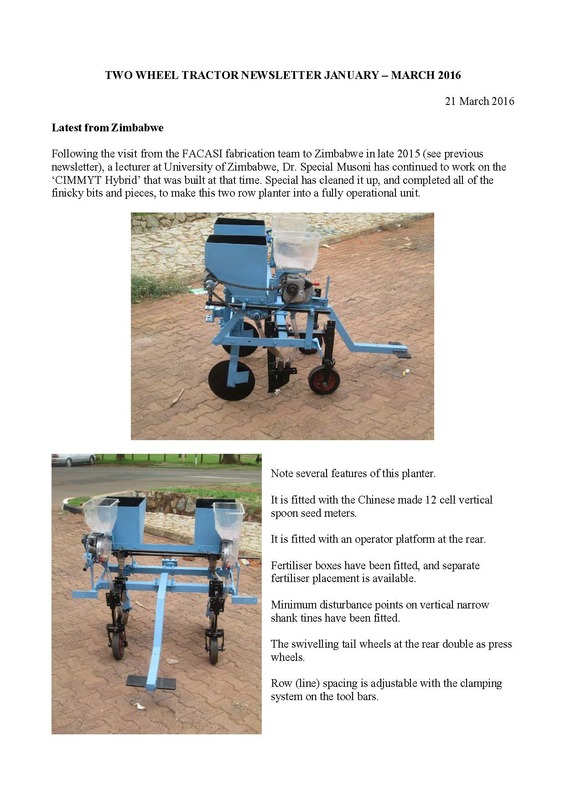 Also a two-wheel tractor driven potato planter and dry direct seeding of rice. Can we make the tines even thinner to reduce the draft on a 2WT tined seed drill? Is strip tillage really no-till? And on using 2WT as a traction unit on steep slopes. About a visit from the South African Delegation, an improved version of an operator stand, a powered roller/crimper for 2WT, and 2WT races by Siam Kubota. 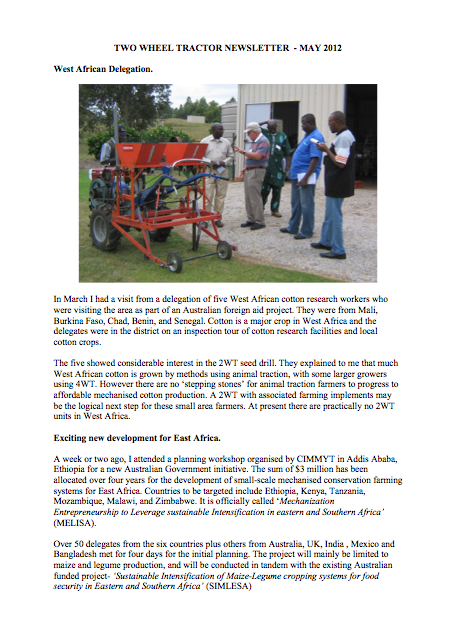 About a visit from the West African Delegation, new CA developments in East Africa, the export of ARC Gongli seed drills, a laser leveller for 2WT, and a Bangladesh-made 2WT potato digger. About a possible ancestor of the 2WT, progress with angled single disc opener, visits to Australia, and whether a newly patented design has a role to play as a disc opener system. About the operation of a device with no-till single and double disc, a harvester for 2WT, and about plate metering and its implements. 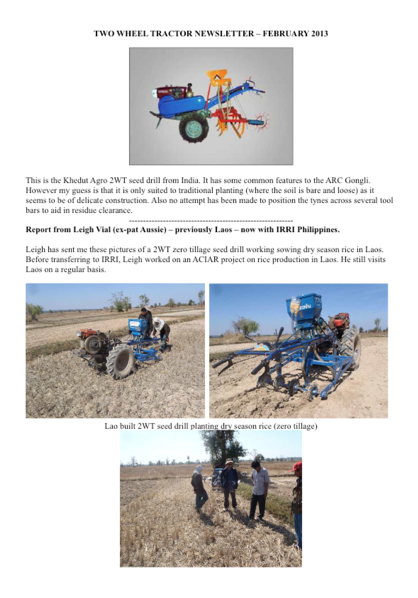 Features several pieces of equipment from Laos including a Siam Kubota 2WT and a two-row Knapik 2WT seed drill from Brazil. 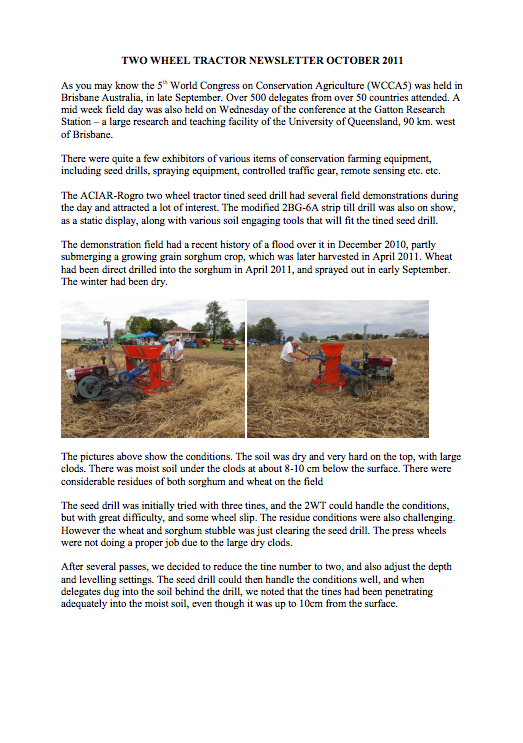 About demonstrations and exhibitors at the 5th World Congress on Conservation Agriculture in Brisbane, Australia (September 2011). 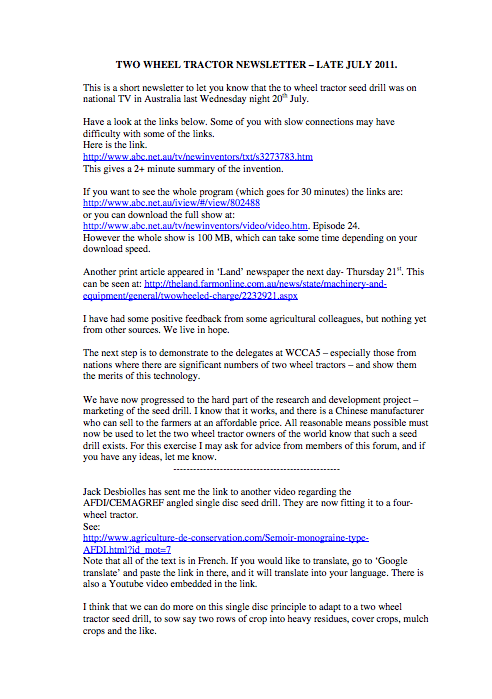 A brief newsletter about the apperance of the 2WT seed drill on national TV in Australia on July 20, 2011, with links. The Conservation Agriculture Group at Cornell University maintains this website with support from the Howard G. Buffett Foundation and the Atkinson Center for a Sustainable Future.